This might sound strange but i just can't decide which dunmer hair colour should i pick. I've always loved white hair and I would almost every time choose it when creating a character in other games. However it's different with dunmer because im not sure if it's lore friendly for dunmer to have white hair. Not just hair which turned white because of their age but white hair since their birth. There are so many black haired dunmer so i might just choose this colour instead of white. But i can't just make up my mind. Could you guys help me decide ? My main Dunmer has a rust coloured brown/red-ish tone that I think fits her nicely. My other Dunmer also generally stick to rust coloured hair, it just seems to fit them better. White hair reminds me a little too much of the Drow from Forgotten Realms I guess. Silver haired Dunmer with Silver eyes and pale gray skin, going for a look more toward Chimer than Dunmer. my main dunmer has white left bob hair and eyes and i like it very much. red hair in this game looks like brown/orange mix. 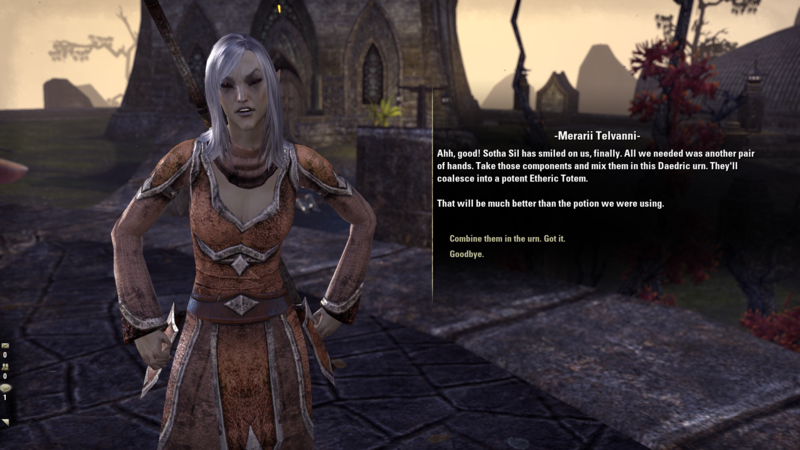 There's a Dunmer with white hair in the Clockwork City, too. In my opinion, they look amazing with white hair. I wasn't exactly trying to match the Dark Brotherhood initiate outfit with my dunmer, but when I logged in and was testing costumes it was pretty much an exact match. I'm not usually one for red hair or eyes, but it totally worked on that one. I just was trying not to look quite so Drow this time... cause I usually am too close to that but it doesn't work out quite right so I end up not liking it.